Design Miami 2013: architect Norman Foster plans to add a row of stone pavilions to the Norton Museum of Art in Florida as part of a major overhaul that will double the building's gallery space, and he unveiled the designs yesterday during the opening of the Art Basel Miami Beach and Design Miami fairs. 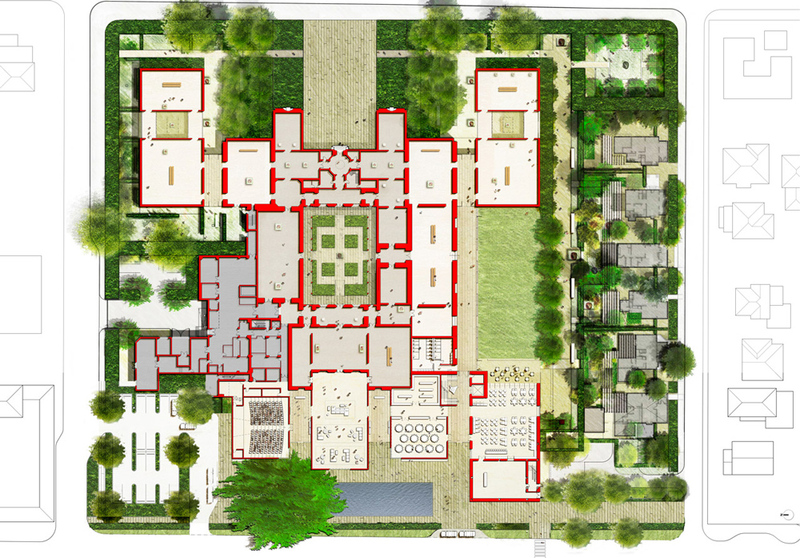 Foster + Partners masterplan seeks to restore the Norton Museum of Art in West Palm Beach to its original axial arrangement by relocating the entrance to the west side of the building. Three double-height pavilions will be constructed along this facade to accommodate a new auditorium, events room and grand hall, and will be sheltered beneath an overhanging metal roof that tapers gently upwards to reduce its visual impact. Based on the concept of a "museum in a garden", the renovated building will be fronted by a pool of water, while a new museum shop and restaurant will open out to a sculpture lawn on the south side of the building. "Our approach is a celebration of the local landscape and architecture," said Foster. "The gardens will be planted with native trees and flowers and the masterplan strengthens the elegant formation of the original museum, redefining its relationship with the city with a welcoming new street frontage." New buildings will be built from white stone to match the art deco-inspired architecture of the original building, which was designed by architect Marion Sims Wyeth and first opened in the 1940s. "The project combines old and new and continues our explorations into the museum in a garden setting, which began with the Sainsbury Centre and has more recently embraced the Museum of Fine Arts in Boston," added Foster. Public facilities will be able to function independently, creating opportunities for evening events outside of gallery opening times. The architects have also developed a long-term masterplan for the site, which includes the possibility of adding two new gallery wings in the future. Three bold new pavilions, unified beneath a shimmering roof, herald the transformation of the Norton Museum of Art in West Palm Beach – host to the most important art collection in Florida. 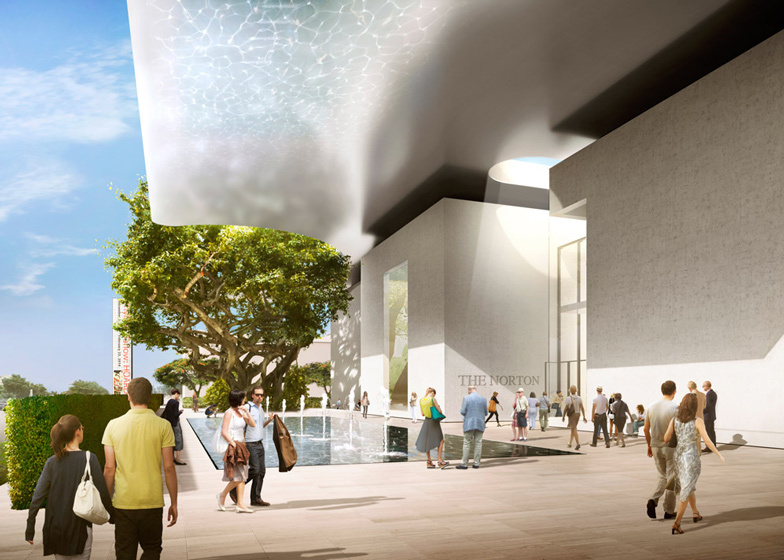 The masterplan, unveiled by Norman Foster in Miami today, allows the museum to almost double its gallery space and lays the foundations for future growth to become Florida's leading cultural institution. The first stage of Foster + Partners' masterplan will establish its key principles: the sympathetic setting of a 'museum in a garden', with the original axial arrangement re-established to unify the visitor experience, and the creation of new public facilities. The museum will become a focus for the community with event spaces separate from the Art Museum, strengthening its role as a cultural destination for Florida. The Norton Museum was founded in 1941 by Ralph Hubbard Norton and his wife Elizabeth Calhoun Norton and was laid out by the architect Marion Sims Wyeth as an elegant series of Art Deco inspired single-storey pavilions around a central courtyard. Subsequent expansion has broken the symmetry of the original east-west axial arrangement, and the creation of an additional car park to the south of the museum has led to the relocation of the main entrance to the side of the building. The new masterplan restores the clarity of Wyeth's plan by reinstating the main entrance on a new street frontage on South Dixie Highway to the west – visitors will once again be able to see through the entire building via a new, transparent grand hall and refurbished glass and iron courtyard doors. The new entrance is signalled by three new double-height pavilions, unified with the re-worked existing wing by a shared palette of white stone. The pavilions house a state-of-the-art auditorium, event space and a 'grand hall' – the social hub of the museum. The design also includes a new museum shop and a new restaurant with al-fresco garden seating which, like the new pavilion spaces, can operate independently of the museum to activate the campus throughout the day and at night. A metal roof canopy floats above the pavilions and projects to shade the entrance plaza. The structure is gently tapered to visually reduce its profile, while providing stability to withstand hurricane winds. The canopy's gentle lustre is designed to cast diffuse patterns of light in an abstracted reflection of people and flowing water below. Linear pools create a tranquil setting for the entrance plaza, masking the sound of traffic, which is visually set apart by a hedge. A curved opening in the roof accommodates the branches of a mature ficus tree and a further light well above the lobby illuminates and defines the new entrance. The overall proposals reinforce the concept of the museum within a garden. Taking advantage of the Florida climate, the landscaping of the gardens and central courtyard incorporates native trees and flowers to provide shaded walkways, and the former parking lot is transformed into a new sculpture lawn. The borders of the museum's expanded grounds are defined and integrate a row of houses at the perimeter of the site as an artist's residence and studio, guest house and research facilities. The new sculpture lawn will provide an open-air venue for 'Art After Dark', the Norton's popular programme of film screenings and events, and is bordered by a glass circulation gallery, connecting the interior with the lush green setting. Subsequently, it will be possible to build two new wings for galleries to the east as part of the long-term masterplan.